The majority of users comment that traction works perfectly outdoors. Several declare that these signature shoes from Adidas fit true to size. Many of the players appreciate the sturdy and lightweight leather used on the upper. A few users like that there is enough room for ankle braces. They say it works like Stephen Curry’s 6th signature sneaker from Under Armour. Most owners agree that the upper material feels high-quality. Because of the shoe's rigid upper, this shoe is durable and can be used as an outdoor basketball shoe. One player relays that the shoe makes him feel quicker and more athletic on-court. The shoe is extremely ventilated due to the breathable mesh and the perforations on the side; allowing air flow in and letting heat escape out. After breaking in, a user loves how the leather conforms to the shape of his foot. Many users comment that the shoe fits narrow; they advice wide-footers to skip this shoe. Some are reminded of the fit of the third Harden signature shoe. Some say that both the cushion and the traction need time to break in. Most of the users complain that the traction does not work on all surfaces, especially dusty indoor courts since dust can get caught in the dense areas of the traction. For players who do not use ankle braces, the ankle area can have some dead space. A number of reviewers can't feel the adiPRENE+ cushioning in the midsole. In conclusion, the D Rose 773 III offers everything a great outdoor basketball should, from the firm and flat traction pattern up to the perfectly ventilated upper. All these elements make up the perfect storm to ravage street basketball with. Sitting at a retail price of $115 USD, the Rose 773 III offers a decent price that ballers in the market for an outdoor hoop shoe should consider. Overall, I really enjoyed playing in these. One of Derrick Rose’s awaited signature shoes, the 3rd iteration of the 773 line is released in August 2014. The D Rose 773 III is a steal at $115 with its updated herringbone traction pattern, a more comfortable SprintFrame chassis, and a lightweight yet durable combination of SprintWeb and leather on the upper. Cushion. The 773 III’s midsole uses the adiPRENE+ cushioning on the forefoot, making takeoffs quite easy. The shoe favors quick players who stay on their toes rather than high-flyers who need impact protection. On the heel is a standard EVA cushion. Traction. The shoe uses a mix of wavy and linear herringbone patterns on the outsole. The pattern is flat and made of firm rubber, making the shoe a great outdoor option. Length and Width. As with most D Rose shoes, the 773 III is true to size yet runs narrow from the midfoot to the forefoot. Before purchasing, it is important to try the shoe on for a comfortable fit. Lockdown. Adidas brings back the SprintFrame chassis for foot support but reshaped it into something less irritating on the midfoot. The frame is effective in containing the foot and locking down the heel, resulting in a midfoot and forefoot that hug the foot like a glove. The heel area, however, still has enough space to accommodate an ankle brace. The shoe has leather as its main upper material. Perforated and lined with SprintWeb underneath, the upper provides a rigid and breathable structure that protects the foot during high-intensity plays. The midsole utilizes adiPRENE+ on the forefoot for responsiveness and EVA on the heel for standard impact protection. The outsole uses a firm type of rubber compound that grips very well on rough courts. 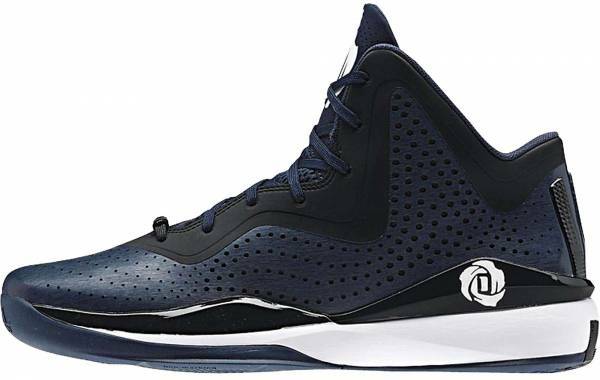 There are more than ten colorways available for the D Rose 773 III, and most of them are usually a combination of black, white, and a dominant color. The shoe’s silhouette is slightly odd with the midfoot raised subtly. The shoe goes for a more classic feel by featuring a leather material for its upper. The look, however, is modernized by the wavy outline and the ventilation holes on the sides. The shoe is accented by a chrome jewel on the lace that has the numbers 773, which is the area code of Derrick Rose’s hometown, Chicago, Illinois. As for branding, the D Rose logo is embossed on the tongue of the shoe and the lateral side of the heel. The Three Stripes can be found on the heel, and extends up to the midsole. Lastly, the Adidas Equipment logo is molded on the tip of the toe box.